Manic Miner Now in SilverLight!! NxtGenUG Co-Founder Richard Costall & Member Pete McGann are pleased to announce their “Silverlight” Manic Miner game Beta is now live on the NxtGenUG site. Manic Miner was originally written by Matthew Smith, under games company Bug-Byte in 1983. The game was a landmark title in the history of gaming. The original classic features 20 caverns to negotiate, and Pete and Rich had lovingly created 9 of these so far, with more to follow shortly. 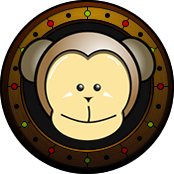 Silverlight Manic Miner shares a custom built ‘time based’ engine with an XNA version of the game. A library of c# files is shared between the two systems. The Silverlight edition is also integrated into the NxtGenuG site, through Application services, and registered visitors can have their high scores recorded and shown in a leader board which refreshes every 60 seconds. In IIS6 when creating a virtual directory it was possible to set the virtual directory to actually add as a redirect to another page or site. In IIS7 this is still possible however it needs to be achieved slightly differently. Lets take an example. Say you have a website and you are running a number of offers and would like to offer users the option of navigating to them through a short path such as domain/offer1, domain/offer2 etc then you would have in IIS6 set these Virtual Directories up with dummy Physical Paths, e.g. the root of the parent site, and set the option to redirect to a URL. In IIS7 because the configuration is stored in a web.config file in the physical path of the virtual directory, this can cause the redirections to be overwritten, i.e. if you set up the redirection of domain/offer1 to go to domain/offers/offer1 and then go and set up domain/offer2 to go to domain/offers/offer2 you will find that both redirections go to domain/offers/offer2 because the value in the web.config file has been overwritten by the second redirect rule. In order to achieve the desired effect and get the redirections to work, you need to actually add the redirections to the applicationhost.config file and set a location tag for the site you are working in. This is currently not possible in the User Interface but is possible to achieve using the APPCMD utility. Here are the steps to achieve this. Hope this clears it up :). 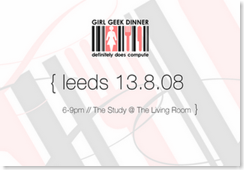 Who can attend: Girl Geeks! A lady who has an interest, or is involved in the Science, Engineering and Technology industries. Blokes can come too, but you need an invite from a Geek Girl. For those who haven't been before, it's dinner, wine, talks from inspirational women, networking and discussions afterwards. Dress up as much as you like, for those of us who like to wear pretty dresses (I am! ), or if you're more comfortable in jeans that's fine too. Currently we have two talks planned, if you want to get involved and speak about women in engineering, science and technology, please do get in touch. Gemma Cameron - How to get young people interested in Geekery! Rachael Hoyle - winner of the Advanced Apprentice of Year Award. Rachael will be delivering an extremely interesting talk around the stigma of women in engineering. This will cover how ethics and equality are the dominant factors in employment, and whether this is damaging the industry, rather than encouraging diversity. It's great to see the Girl Geek Dinners this side of the M25 and I hope this is the first of many more events in both localities. Awarded Microsoft MVP Award for IIS! This afternoon I received an email from Microsoft telling me that I've been awarded the 2008 Microsoft MVP award for my efforts in the Internet Information Services Community over the past year. This is a great honour to be classified in the same group as the many other great MVPs who do great work throughout the community. I hope I can continue in the same way in the coming months and years. This morning I was installing the Conferencing Add-in for Microsoft Outlook so I can set up VBUG Online Meetings and send out invitations direct from Outlook when I mentioned on Twitter that I'd been having problems with the Outlook process constantly running despite my having closed/shutdown Outlook. This has been a really big annoyance for me for a while and I hadn't found the solution. Thanks to the power of Twitter I've been able to sort this problem now and identify what was causing it. Usually behaviour like this is attributed to a bad add-in running in Outlook. Well I checked my list and found I had a couple of add-ins which I didn't recognize. First was an iTunes Outlook add-in. What was iTunes wanting with outlook, well I believe it is linked to the ability to sync calendar and contact information with my nano - something I've never wanted to do as I have a Windows Mobile 6 phone for that, so I removed that add-in. Next was Xobni an outlook plugin which I was trying out but have decided to remove as I don't really need what it offers. So now I tried running Outlook and exiting but found it was still leaving the process behind. One of the tweets I'd received mentioned Skype as a potential problem so I shut that down, fired up Outlook and then closed Outlook, checked in task manager and the process had successfully closed. I then started Skype, then Outlook and then closed Outlook and checked and the process was still running. After a little searching in the Skype forums I found the fix for my problem - http://forum.skype.com/index.php?showtopic=97020 - and it seems that the problem is known and it appears that it's just the way Skype works - what !! if I closed a program I don't expect another one to keep it running! It appears that the View Outlook Contacts "feature" in Skype causes Outlook to remain running in the background. The fix is to go into Skype, goto the View Menu and uncheck View Outlook Contacts. If this option is greyed out you need to run Outlook, return to Skype while Outlook is running and the option should no longer be greyed out, allowing you to uncheck it. Now Outlook shuts down and the process ends properly! This "feature" is a problem in my mind - why can't Outlook Contacts get store in some form of cache in Skype so therefore not needing a permanent connection to Outlook? The power of Twitter and social networking has helped me to fix this problem and I hope I can repay that in future through my interactions with Twitter, Facebook etc. Special thanks go to @mehfuzh, @blowdart, @garyshort, @markjbrown, @recumbent and @james_a_hart who helped me out with some very useful time and tweets! On the evening of Wednesday 2nd July 2008, I'll be presenting a session on IIS 7.0 for ASP.Net Developers at Black Marble's Community Evening in Bradford. This event is part of a full day of sessions which Black Marble are hosting. In the morning they're hosting a session on Overview of the current and future states of Microsoft’s Real World SOA and Business Process Automation platform and in the afternoon they are hosting a TechNet in the North session - Microsoft's Vision for Unified Communications - delivered by James O'Neill and then I will be completing the day with the community element. One of the biggest and best new features of Windows Server 2008 and Windows Vista is Internet Information Server 7.0. IIS 7.0 is the latest and most significant release of Microsoft's Web Server. With this release comes a new extensibility model which gives developers more options than ever before, more diagnostic tools with which developers can debug and locate issues. During the session Andrew will investigate the new architecture, look at extending, configuring and developing for IIS7, take a look at its management user interface, and introduce the debugging and diagnostic facilities within IIS7. I first saw this announcement on twitter last week, that the Windows SideShow team had released a Developer Preview of SideShow for Windows Mobile 5 and 6 devices - http://blogs.msdn.com/sideshow/archive/2008/06/02/sideshow-on-windows-mobile-released-techready-2008.aspx and over the weekend I installed SideShow for my Windows Mobile Device. I have an O2 XDA Orbit, which is a Windows Mobile 6 Device, and a variant of the HTC Artemis. The installation process is reasonably straight forward and the documents provided give detailed and easy to follow instructions of how to install the preview. SideShow is a really cool feature of Windows Vista and something I covered at the Exchange, Vista and Office (EVO) launch events which I took part in and spoke at last year. I covered a couple of devices in previous blog posting CES - So Many New Toys! - Windows Vista SideShow and with the addition of Windows Mobile support it opens out the platform a little more. The key use of SideShow will be through mobile devices, remote controls for Media Centre and other devices such as Fridge Magnets etc. I'd read about a PowerPoint controller gadget for SideShow - http://gallery.live.com/liveItemDetail.aspx?li=fe99f5dc-e62d-46e0-a294-1ec3aa4960c4&bt=8&pl=7 and went and installed this gadget to really see what it could do. I use a variety of devices for controlling PowerPoint when delivering presentations such as the Wireless Notebook Presenter Mouse 8000 and the Microsoft Presenter 3000 one of the devices is a mouse and the other is purely a remote presenter device. The PowerPoint controller gadget takes this to a new level and allows you to view the presenter view of your presentation, advance and reverse through your slide deck. This added functionality of seeing notes etc. I'm really enjoying the experience with this preview on my device, if your interested in SideShow and you have a Windows Mobile device - what not take a look? I'm hoping to see more gadgets and functionality coming through, i.e. possibly gadgets so we can control media centres using a mobile device. Developer Developer Day returns to Reading on Saturday 22nd November 2008, and the call for speakers is now open, giving plenty of time for anyone who would like to submit a session, to prepare an abstract and think about what they would like to speak about. So if you have a session, double session or grok talk you're interesting in submitting please go to http://www.developerday.co.uk/ddd/agenda.asp and fill in the short form. Also as there is plenty of time before DDD7, if you would like to have some practice at delivering your session why don't you contact your local VBUG group or any of the other great Usergroups in the UK, I'm sure they'd love so have some new session for their groups to see. Developer Day events and usergroups offer great ways for new speakers to gain experience and feedback with delivering technical presentations. If there is a topic you're passionate about why not start off with a 10 minute Grok Talk at DDD or your local usergroup and then build up your confidence and presentation from there, before you know it you'll be delivering full hour long sessions. Go on give it a go! !